In its conclusions to the judgement, the court directed the federal and provincial governments to monitor and prosecute those advocating hate, extremism and terrorism. 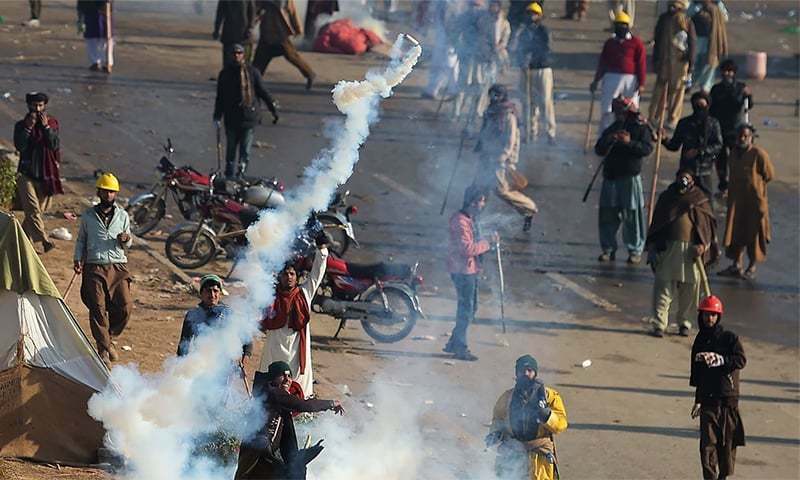 The Supreme Court on Wednesday wrapped up a suo motu case of the 2017 Faizabad sit-in staged by the Tehreek-i-Labbaik Pak­is­tan (TLP) and directed the government, law enforcers, intelligence agencies and the army's media wing to operate within their mandate. On Nov 22, 2018 a two-judge SC bench comprising Justice Qazi Faez Isa and Justice Musheer Alam had reserved its judgement and closed the hearing of the case that was initiated on a suo motu on Nov 21, 2017 ─ after dishing out severe criticism to the attorney general, media regulator and other stakeholders. The bench today did not read out the verdict in court and told reporters that a written copy of it would be uploaded onto the Supreme Court website. It also ordered the government ─ through the defence ministry and respective chiefs of the armed forces ─ to initiate action against armed forces' personnel found to have violated their oath. Police and other law enforcement agencies were directed to develop "flexible" standard operating procedures to deal with similar protests in the future. The judgement states that any person who issues an edict or fatwa that "harms another or puts another in harm's way must be criminally prosecuted under the Pakistan Penal Code, the Anti-Terrorism Act, 1997, and/or the Prevention of Electronic Crimes Act, 2016." The court notes that citizens have the right to form and be members of political parties, subject to "reasonable restrictions" imposed by the law. Each citizen and political party retains the right to peaceful assembly and protest, as long as it complies with the "reasonable" legal restrictions "in the interest of public order". "The right to assembly and protest is circumscribed only to the extent that it infringes on the fundamental rights of others, including their right to free movement and to hold and enjoy property." The court asserted that "protesters who obstruct people's right to use roads and damage or destroy property must be proceeded against in accordance with the law and held accountable". The judgement notes that the responsibilities of the Election Commission of Pakistan (ECP) ─ as laid out in the Constitution ─ must be fulfilled. The court stated that the ECP must proceed in accordance with law against political parties violating the law. "The law is most certainly not cosmetic as contended on behalf of the ECP," the order said, adding: "All political parties have to account for the source of their funds in accordance with the law." The judgement noted that the state's failure to "prosecute those at the highest echelons of the government who were responsible for the murder and attempted murder of peaceful citizens on the streets" of Karachi during the May 2007 lawyers' protests "set a bad precedent and encouraged others to resort to violence to achieve their agendas". "The state must always act impartially and fairly. The law is applicable to all, including those who are in government and institutions must act independently of those in government," the court asserted. The court also directed the federal and provincial governments "to monitor those advocating hate, extremism and terrorism and prosecute the perpetrators in accordance with law". The judgement said that Inter-Services Intelligence, the Intelligence Bureau, Military Intelligence and the Inter-Services Public Relations "must not exceed their respective mandates". "They cannot curtail freedom of speech and expression and do not have the authority to interfere with broadcasts and publications, in the management of broadcasters/publishers and in the distribution of newspapers." The judgement said that intelligence agencies "should monitor activities of all those who threaten the territorial integrity of the country, and all those who undermine the security of the people and the State by resorting to or inciting violence." It added that it would be appropriate to enact laws "which clearly stipulate the respective mandates of the intelligence agencies" in order to "best ensure transparency and the rule of law". "The Constitution emphatically prohibits members of the armed forces from engaging in any kind of political activity, which includes supporting a political party, faction or individual. The Government of Pakistan through the Ministry of Defence and the respective chiefs of the Army, the Navy and the Air Force are directed to initiate action against the personnel under their command who are found to have violated their oath," the court said. The court directed the police and other law enforcement agencies to develop standard operating procedures and plans on "how best to handle rallies, protests and dharnas, and ensure that such plans/procedures are flexible enough to attend to different situations". "It is clarified that, though the making of such plans/procedures is not within the jurisdiction of this court, we expect that in the maintenance of law and order every effort will be taken to avoid causing injury and loss of life," the order said. The judgement stated that cable operators who had stopped or interrupted the broadcasts of licensed broadcasters "must be proceeded against by the Pakistan Electronic Media Regulatory Authority (Pemra) in accordance with the Pemra Ordinance". However, it added, "If this was done on the behest of others then Pemra should report those so directing the cable operators to the concerned authorities." Additionally, the court said that broadcasters who broadcast "messages advocating or inciting the commission of an offence" are in violation of the Pemra Ordinance and the terms of their licenses, and must be proceeded against by the watchdog "in accordance with law". The judgement also warns those "spreading messages through electronic means" that statements that "advocate or incite the commission of an offence are liable to be prosecuted under the Prevention of Electronic Crimes Act, 2016". The court had taken up the case after taking notice of the traffic congestion arising out of the sit-in and summoned a report from the ministries of interior and defence, Intelligence Bureau and Inter-Services Intelligence (ISI). While initiating the case, the court had regretted the use of abusive, filthy and provocative language by the leaders of the sit-in and held that this tended to promote enmity. The issue cropped up when, during the hearing of a case in 2017, the same bench had noticed an application seeking adjournment on behalf of senior counsel Mohammad Ibrahim Satti, who was representing petitioner Sher Jamal. The application for adjournment was moved by Advocate on Record Syed Rifaqat Hussain Shah on the grounds that the counsel could not reach the courthouse because he lived in the area that had been blocked off due to the sit-in. At this, the court had sought the assistance of the deputy attorney general in attendance and asked him whether highways and roads were blocked, to which the official had replied that he himself had faced tremendous difficulties in reaching court despite leaving home around 6:30am. In the order that followed, the apex court had regretted that Islamabad and Rawalpindi were being held hostage by a few ‘miscreants’ while the state functionaries appeared to be negotiating with them rather than clearing the way for the public who were being denied access to courts, schools, and places of work, etc. The court had said that people taking part in the sit-in and their leaders were ostensibly advocating a religious cause but had not moved the courts, including the Federal Shariat Court. They were taking the law into their hands and were sowing divisions (‘tafarruqu’) and differences (‘ikhtalafu’) against the clear proclamations by Almighty Allah in Surah Ash-Shura (42) ayat 13 and Surah Al-Imran (3) ayat 103 and ayat 105. Before reserving its ruling for a final judgement, the Supreme Court had also asked Attorney General Anwar Mansoor to furnish a report on behalf of the federal government about the mandate of ISI. Daily life in Islamabad was disrupted for 20 days (from Oct 2 to Nov 27, 2017) when protesters belonging to religiopolitical parties ─ including the TLP, Tehreek-i-Labbaik Ya Rasool Allah (TLYRA), the Tehreek-i-Khatm-i-Nabuwwat, and the Pakistan Sunni Tehreek ─ occupied the Faizabad Interchange which connects Rawalpindi and Islamabad through the Islamabad Expressway and Murree Road, both of which are the busiest roads in the twin cities. The agitators believe that during the passage of Elections Act 2017, the Khatm-i-Nabuwwat oath was deliberately modified as part of a larger conspiracy. The amendment to the oath was deemed a 'clerical error' by the government and was subsequently rectified through an Act of Parliament. The government had attempted to negotiate with the protesters to end the sit-in several times, but failed each time. 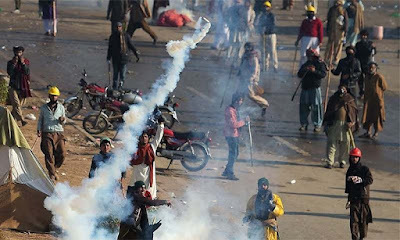 Finally, it launched an operation to disperse the protesters, in which at least six people were killed and scores others injured. After the botched operation, the government decided to call in the army for help. Negotiations were undertaken with protesters once again, and the government accepted a number of their demands in return for ending the protest. The agreement document bears the signatures of then interior minister Ahsan Iqbal, TLP chief Khadim Hussain Rizvi, and Maj Gen Faiz Hameed, among others.